1. Do you know which padding to use for your home? Which padding is the best deal? Rebond - Best bang for your buck! Most common. None of the above - These special features are not required, make little difference, if any, and are expensive. 4 pound Not dense enough, warranty void. Used in apartments. 5 pound Not dense enough, warranty void. Used in apartments. 7 pound Who makes a 7 pound pad? Not a common Padding Density. 10 pound Too dense for most homeowners. Great for stairs and main walkways. ½" Commonly used but a bit too thick, warranty can be voided. Nylon Best for high traffic applications, most resilient fiber. Polyester or P.E.T. Lowest cost, matting and crushing a common problem. Nylon / polyester blend Upgrade: Matting and crushing problem reduced. Sorona/Smartstrand A newer product, made from corn polymer. Resists stains, Cleans easily. 6. There are different ways to make carpet. Would you rather choose a Continuous Filament Nylon fiber or go with a Nylon Staple Fiber? Continuous Filament Nylon (CFN) aka Nylon BCF or Nylon CF. A Continuous Filament is the smart way to go. Carpets made with a staple fiber (short lengths of fiber) are prone to shedding and fuzzing. That means you would be vacuuming up bag after bag of carpet fibers. It is not fun, it's bad for kids and pets who may inhale the loose fibers and it makes your carpet look horrible. Shedding and fuzzing can continue up to one year after installation. 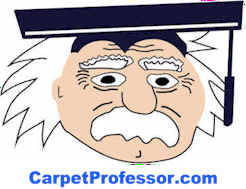 Yes A great place to learn all about carpet characteristics like allergies, air quality, installation procedures and more. Yes Your carpet must be installed to this standard. Required to keep your warranty in effect. They will issue a pro-rated credit to your retailer equal to the cost of the carpet material only, for the affected area only. The credit is good only toward new carpet from the same manufacturer. They will likely not pay to remove your old carpet, move your furniture nor will they likely pay to have your replacement carpet installed. They will pay to have the carpet repaired, if possible. It is your responsibility to inspect the carpet for obvious defects before the installers install it in your home. This means you will have to ask the installers to roll it out for you to inspect thoroughly. (in your driveway?) Once the installers cut the carpet, you will lose your carpet defect warranty if an obvious carpet defect is found. In some cases they will pay the installers to remove and reinstall your defective carpet. It is unlikely they will pay to move your furniture or compensate you for your time and trouble or time off work. There may be some difference in color shading or texture from the old carpet to the new carpet due to dye lot variations. The day before - 24 hours prior, stored in a heated area above 65 degrees, a warranty requirement. Did you learn something? I have made this quiz an informative aspect of my website because I want you to learn what you need to know about buying carpet. There is so much more information you need to know before you spend a dime on carpet. The important thing right now is that you do your homework before you buy carpet. If you learned something by taking this short quiz, then it should be a wake-up call for you. The questions on this quiz are the easy ones. It gets harder to make the right choices and carpet scams are common. Most people really think they know enough to buy carpet wisely, but few really do. Some people put their trust in the hands of carpet salespeople. This is a common mistake. I get e-mails all the time from consumers who blindly took the advice of a salesperson only to get burned.